Once we agreed this plan with our guests, we soon set off, cruising across and then along the Noordzeekanaal and back past the Amsterdam Central station and along the Afgesloten IJ towards the Orangesluis, taking care to cross the navigation and proceed along the small boat channel outside the main channel as the local harbour police are very strict about that. On approaching the Orangesluis I had to wait for the next lock and then a host of other craft arrived and the sluis-watcher had to use his loud speaker system to move everybody forward. The cruise from Orangesluis along the Buiten IJ channel and out into the Markermeer was very straightforward and calm and so I got Sarah up to the helm and gave her some training as well as making sure she was occupied, distracted and scanning the horizon which is the accepted way of avoiding sea-sickness for those who are susceptible. 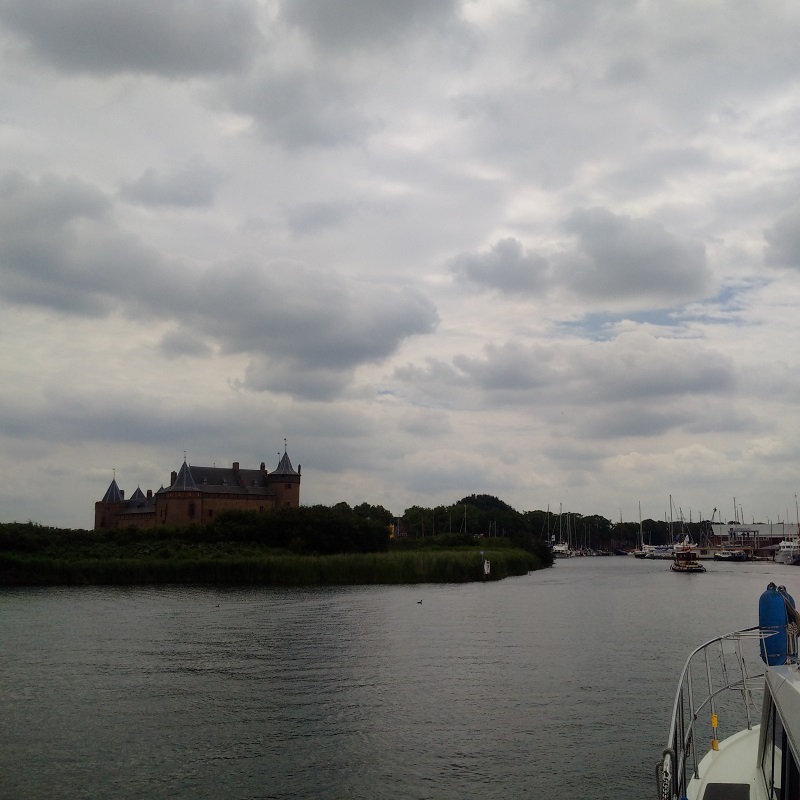 Then across the rest of the Markermeer in a south-westerly direction before joining the Muiden channel and turning due south to make the harbour moles with Sarah back at the helm. 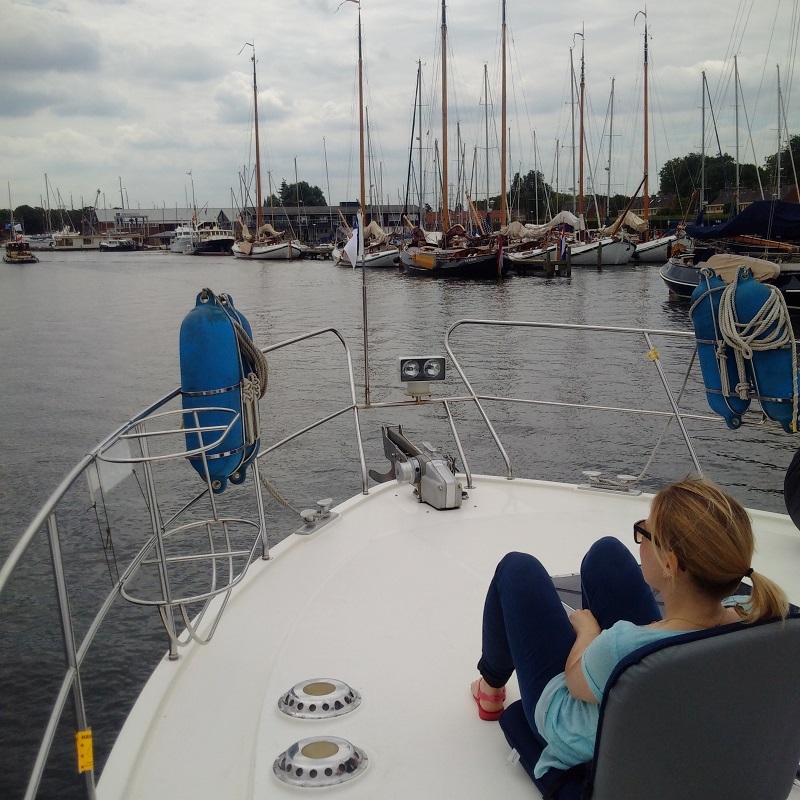 I then took over and cruised into a vacant inside steiger in the JH Stichting Marina but found the duty harbourmaster rather unhelpful. It is quite normal to have your length and breadth (beam) note but he was already busy writing out the invoice and insisting that we enter a box opposite rather than the alongside mooring! I thanked him, declined and said I was going to try my luck at the JH KNZ & RV opposite and we had a totally different reaction. The harbourmaster cleared a fine alongside berth for us, insisted that we left the money until later and it was a totally different reaction. 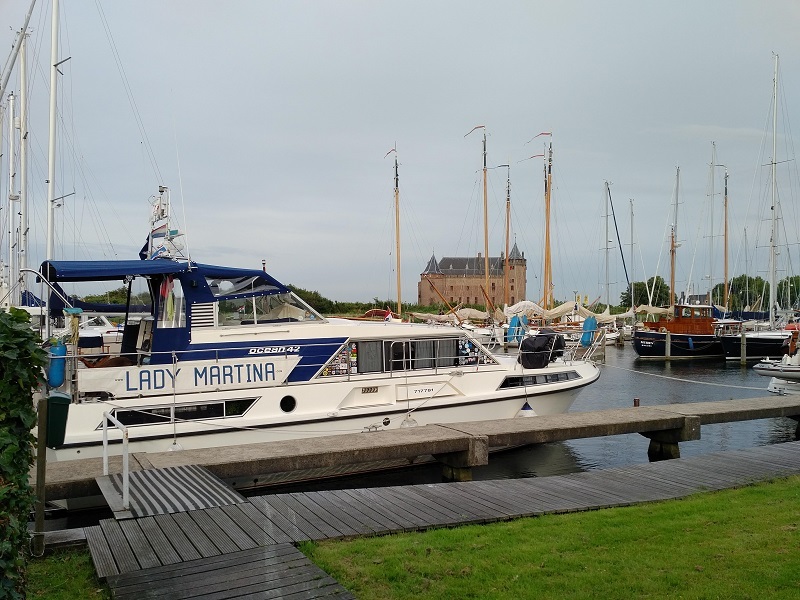 After this we took lunch in the centre of Muiden with our guests, let them take a walk along to the Muiderslot castle whilst we walked Max and then came back and rested on Lady Martina before all enjoying Mussels at the this fine yacht club later on. The weather had been fairly quite today, after all of that wind of the last few days, but was freshening this evening although it remained warm.